administrative capital of Palestine, Ramallah is located in the hills of the central West Bank, north of Jerusalem, about 900 meters. It has about 40,000 inhabitants and 220,000 when taking into account all of the city. Several Israeli checkpoints in control access. The city has a modern look, with long avenues where accumulate traffic jams and high buildings. vibrant and lively, it is crossed from east to west by Rukab Street, where successive boutiques, bars and a shopping center. In the old town, you can taste the local specialties in street stalls, and mingle with the regulars in a relaxed atmosphere. 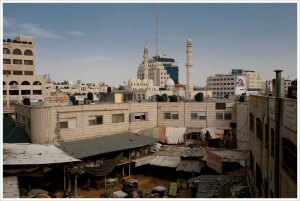 However, even if economic development is rapid, Ramallah does not reflect the life of the rest of Palestine, and it remains a place where one does not leave easily. Moreover, the cultural life is limited, represented mainly by Al-Kasaba theater, which is also a film library. There are also the mausoleum of Yasser Arafat, and you can also visit beautiful churches, such as the Epiphany, Greek Orthodox Church. But the main reasons that attract the Palestinians in Ramallah, they are shopping and nightclubs and trendy restaurants that young people are particularly fond. Items to bring a souvenir clothing, olive oil, embroidery.